It is the coming crisis that absolutely nobody, from the innumerate man in the street to the technocrats leading the EU, understands or has any idea how to stop. What are the options for the Eurozone’s future? Greece wants to stay in Eurozone but is unable to pay bailout debts, goes bust leaving French and German banks with billions in write-offs, Eurozone fucked. Greece negotiates delay to bailout debts, situation unfolds exactly as above but nineteen months later, Eurozone fucked. Greece leaves Euro, pays debts with worthless new currency backed by nationalised industries of goat-herding and slapping octopi on wet rocks, Eurozone fucked. Greece leaves Euro and EU, says it never wanted to be in either in stream of passive-aggressive posts on social media many of which quote Radiohead lyrics, pays debts with worthless currency as above, Eurozone fucked. 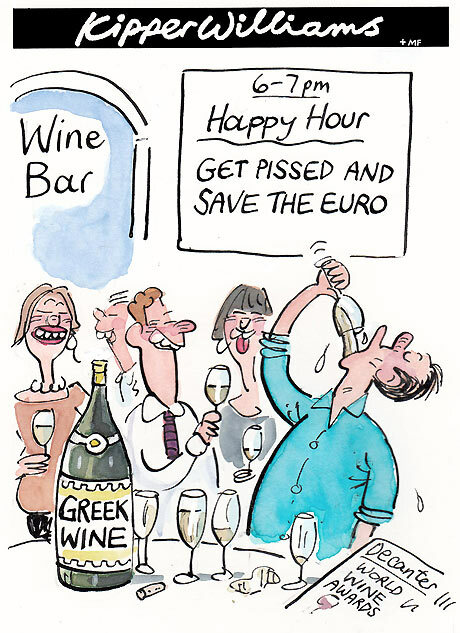 Greece leaves Euro and EU, is joined by Spain, Italy, Portugal and Ireland to form new cool EU for countries who prefer having a boozy laugh to working, all of whom are too irresponsible to even bother opening letters about debts, Eurozone fucked. Greece stays in Eurozone, agrees to banks’ demands to sell off citizens’ organs to pay debts, angry citizens elect fascist government which invades Turkey, Macedonia and Albania, war spreads across whole continent, one-third of EU population killed and economy saved by resulting boom in industry. Preferred solution of banks, IMF and Switzerland. I know a few Greeks. I would not mess with them. Breaking news of world importance, Cobbers!